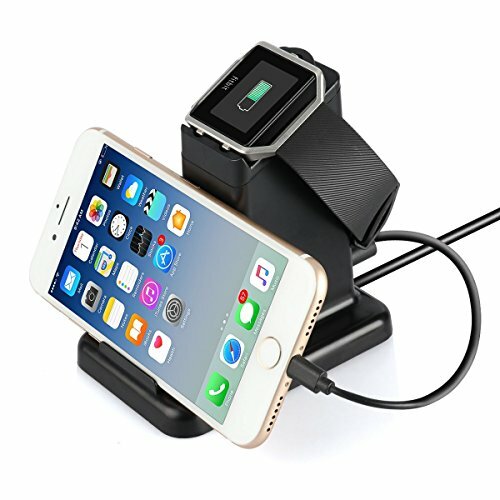 This Upow 2-in-1 Fitbit Blaze Charging Stand can be a combo of a charging station for Fitbit Blaze and a charging stand for your smart phone or tablet. It is made from durable ABS material with non-slip design in black popular color best fit for your exquisite Fitbit Blaze fitness wristband. Just connect the USB cable to your PC or any 5V/2A AC adapter, it will charge your Fitbit Blaze. 1.Please notice that this charging stand is not compatible for any other Fitbit models, just for Fitbit Blaze. for holding and protecting your device, so it requires you to push your device down on the charger to charge. Fitbit is not magnetized so it will not adhere to the charger by just laying it on the top. You have to push the watch into the slot. It slides in very easily and it stays in place. If you have any questions about this product by MixMart, contact us by completing and submitting the form below. If you are looking for a specif part number, please include it with your message.